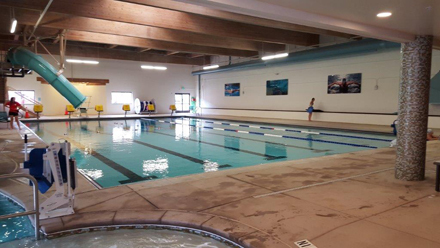 In 2013, voters approved a $7.8 million property tax increase for the renovation of the Clear Creek Recreation Center. The project included major renovations to the existing recreation center and a much-needed addition of new facilities. The project serves the growing community as well as bringing the center up to the standards of centers located in neighboring communities. The design included several new features, such as: aquatics, meeting and community spaces, child care and teen spaces, dedicated group exercise rooms, areas for free weights and equipment, cardio areas, renovated and expanded locker rooms, an indoor running track, a roof top deck for exercise and social functions, and offices for district personnel. The main visual attraction is the newly renovated indoor pool. Features include renovation of the 3,400 sq. ft. existing lap pool, which included the replacement of the mechanical systems as well as adding a drop waterslide. The new 1,000 sq. 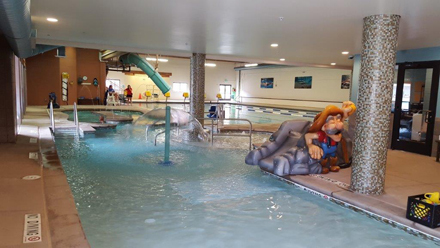 ft. recreation pool includes zero entry, current channel, underwater bench, stair entry, tot slide, underwater shelf, spray feature, and a runout waterslide. The 175 sq. 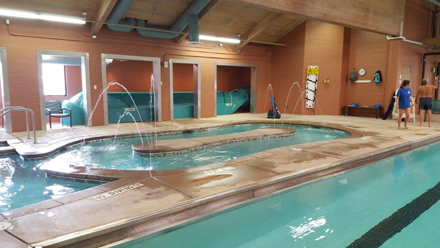 ft. spa was designed for relaxation and features an ADA accessible chair lift. The renovation resulted in a dynamic and flexible operation, focusing on healthy lifestyle opportunities. Also included were efficient service models that will respond to the current and future expectations of community recreation programs by meeting the projected needs and growth of the community for the next 30 years.